We shall never forget you, Abhinav! Back to those days, when Indian shooters have started featuring in international tournaments, an era had started striving to culminate some day. And this was 1994 with Commenwealth and Asiad games. Before that, I don’t think anybody had expected us to do anything in shooting. After the ups-and-downs of Indian hockey, there wasn’t many hopes left. In the 90s or few years before that, lifters, first men and then women, had started emerging in many game events. Olympic was still a dream for every and all. Weightlifters performed quite well in the 90s, snatching many medals at Commonwealth and Asiad, later with a bronze by K Malleshwari at Sydney Olympic. Shooters were also participating and winning medals sometimes, but it was the mid-90s when they came on the forefront. Led by Jaspal Rana and Mansher Singh. Rana was miraculous and very popular among Indian sports enthusiastics. This was the sign of emergence of Indian shooting when the name of Rana, from an unconventional sport, begun mumbled by the common Indians. So, when the hockey was shrinking and track-and-field was still in far horizons, these new-gen sportsmen (and women) were new hopes for Indian sports. I remember people, who used to shout hockey whenever Olympic got mentioned to them, making predictions for medals and counting names of Rana and sports like shooting and weightlifting. From that time, it remained the same for more than a decade. In general, there is nothing much special about it, but if we look at this again, it is no doubt a tremendous developement. Ofcourse, a nation which doesn’t think of anything except Cricket and whenever it came to non-cricket, it was India’s ol’ days hockey stincts and Milkha Singh’s loss by 1/10 seconds. Besides these, there were occasional talks about Kabaddi (at Asiads only) and Tennis. Billiards, Badminton, and Long Jump were mentioned with their lone riders. Except that, I am not able to recall anything from my childhood memories which is broadly concerned with my seniors from that time and newspapers eteceteras. It was 1994, when India grabbed 3 golds in the commonwealth (5 in total) in shooting, featuring Jaspal Rana with 3 medals. Since then, Rana overshadows Indian shooting till 2006 Asian Games. Mansher Singh and Samresh Jung complimented Rana in Pistol events for a long time. Samresh Jung’s failures at Olympcis, now and then, can’t defy his talents that he posses and has shown at times. It is unfortunate that he is yet to reckon in the frontline. Among the females, there were two noteworthy players – Usha Unnikrishnan and Anjali Vedpathak (Bhagwat). Commonwealth 2002 was the culmination of Indian shooters (and weightlifters). Indians almost swept both categories with 24 medals (14 golds) in Shooting and 27 medals (11 golds) in Weightlifting. Mansher Singh and Usha Unnikrishnan had retired till then to give places for other future players. Many of them emerged as the stars of Indian shooting. 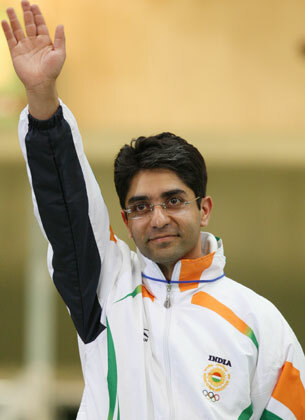 Some of them were Anjali Bhagwat, Rajyawardhan Singh Rathore, and a young chap called Abhinav Bindra. Among the weightlifters, the star medalists were- Kunjarani Devi (3 golds), Kunjarani Devi (3 golds),Shailaja Pujari (3 golds), Pratima Kumari (2 golds, 1 silver), Thandava Muthu (3 medals), Sunaina Sunaina (3 medals), Prasmita Mangaraj (3 medals), and Neelam Sethi Laxmi (3 medals). Commonwealth 2002 made Jaspal Rana and Anjali Bhagwt household names. Everybody knew about them back then and super-performance at Commonwealth pushed the expectations much forward. However, this glory didn’t remain luminous in the 2002 Asiad games. Shooters could grab only 2 silver medals, much below the earlier performance. But, the stints at commonwealth were enough to sparkle the hope for the fans. The target was already set and the aim was the olympic. In 2004 Olympic, Armyman Rajyawardhan Singh Rathore finally won the excellent Silver medal, in men’s double trap. This re-iterated the Indian claim in shooting. In the coming sports events, although the stage was not properly set at the international stage, the prime indian attention was mainly on the shooters. After a mixture of success at Commonwealth, excellent entry into the Olympic, and failure at Asiad, the journey of shooter again started in 2006 which was much better than the earlier performances. The stardom didn’t remain the same, however. No wonder, why the shooters were at the main target of any Indian who has anything to know about or do with Indian athletes and sportsmen at olympic, this year. The association also had said, before the cast and crew left for the big event, that the shooters, pugilists, and lee-hash are the super favourites this time and we are hoping for a better performance because the hockey has not overshadowed rest of the sports. I must remind that the 8-time Olympic gold medalist had lost the chance to participate in Beijing Olympics earlier after loosing badly in the pre-qualifiers. Anyways, the statement of association was kind of an exaggeration, as I thought at that time. I mean, okay, look at stats, what is India in Olympics without hockey! Man, we had Gold metals good 8 times. In the next moments, shooters gave me hope and it was for our good otherwise whats the use of sending Indian troop to China if our entire hope is based on sticks only. And anyways, there will be no Indian hockey in the olympics this time, so what!! what all they had been able to do since 1980. Damn 28 years! “ I would like to reiterate that everyone who represents India at the Olympic Games has put in years of toil and sweat. I ask the Indian people to support our athletes more. It is fine to celebrate our achievements but it is just as important to keep up the backing when we are not on top of our game. It is important for India to do better at Olympic sport as these are the true measure of a nation’s sporting depth. I wish more private initiatives come up with corporate support apart from the backing of the government. The joy that the nation feels at my win is humbling. I just wish that this is repeated more and more often. Which means why do we forget Ranas, then Rathores, and Bindras? How is it possible for us to flock in lakhs when our cricket team wins t-20 and after few months, throw stones at the houses of same players who lost a match or two after few months? How the first individual olympic medal winner of India died in poverty? It also says that why a nation of one billion population and billions of resources was unable to win single gold model? And how the same players thrived at the same occassions when supported by their rich parents (Abhinav Bindra) or supported by some private organizations (Saina Nehwal and Akhil Kumar, supported by Mittals)? Abhinav Bindra is a hero but we didnt make Bindra a hero and nor did the government, no matters how much they scream. But, indeed he is an hero of one billion Indians, now and forever. And we could have more Bindras if we listen to that great boy! Had we given this flocking award money to the players like him during their training and preparations, we would have dozens of Bindra grabbing medals every olympic day! As usual, everybody (our politician mai-baaps) was distributing our hard-earned money to Bindra (as if it was their own) after he returned India. The most amusing award was from Laloo Prasad. He gave one-year (or it was lifetime, I dont quite remember) free travel in Indian Railway’s AC coach. Mister! this guy had enough money to train himself in France, would you take him Paris on you railway coach!!! This guy has corporate value of over $ 20 million per year and his father already gifted him much than you could imagin! Now, please, give free rail passes (2nd class, not AC) to our rural sportsmen, they will get much more benefits! And to Bindra, we salute your success and we are not going to forget you and your talent in this lifetime! And we have similar respects and appreciations for Saina Nehwal and Rajwendra Singh Rathore, Akhil Kumar, Jitendra Kumar, Vijendra Kumar, and all our other sportsmen! For now, I am going to cheer out loud for our rocking pugilists. Come on, guys, dikha do! Previous Post Who says India lags behind in education? The Dawn Chorus » Mi Vilasrao Deshmukh Boltoye!